If continents can drift 20 centimeters farther from each other over 20 years, imagine how a volatile rock band can scatter in that time. 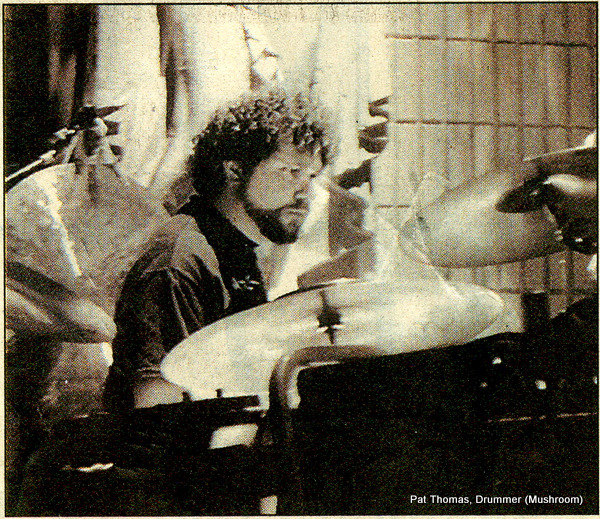 The drummer to San Francisco. The bassist to Maine. The guitarist to Seattle. The lead singer to Ithaca. 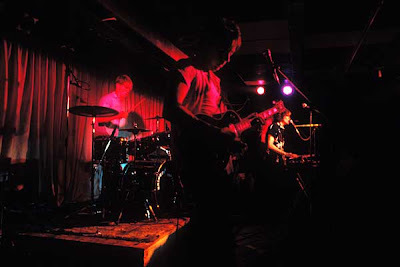 Twenty years ago, those four pieces were Absolute Grey, one of the best, most happening bands that Rochester has had to offer to the music world. It was beyond music, even. “It was multimedia in its earliest, roughest form. That’s how pretentious we were back then,” recalls bassist Mitch Rasor of a show at the Pyramid Arts Center. 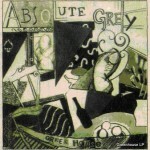 Now the album that Anderson recorded hi his attic studio, the Absolute Grey debut, Greenhouse, has just been re-issued. 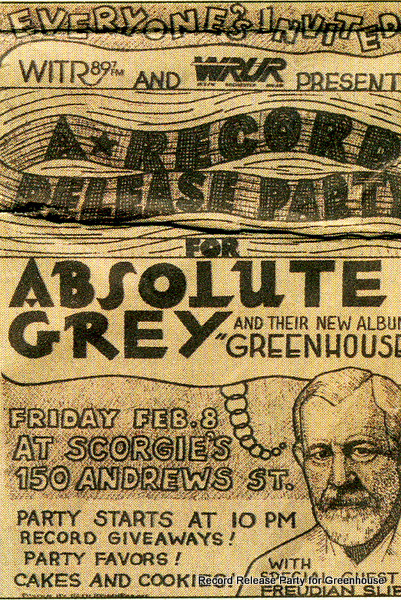 It’s accompanied by a live recording of the band playing at Scorgie’s, speaking from an era when groups such as R.E.M. could emerge from the world of independent, underground music to become stars, their noncommercial integrity still intact. 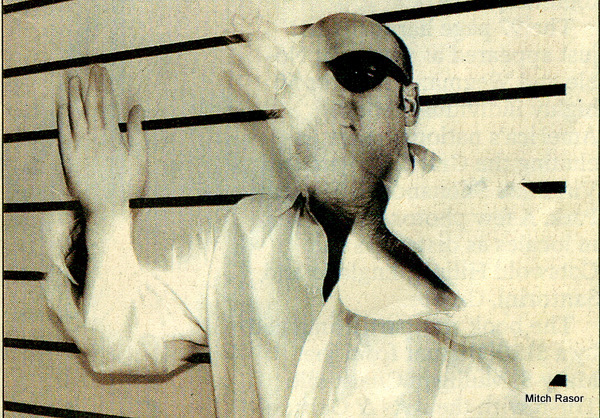 this day – such as R.E.M. guitarist Peter Buck, who’s quoted on a sticker on the new CD jewel box claiming “I still have the original LPs” – is Exhibit No. 2 that Absolute Grey is more than a passing moment. 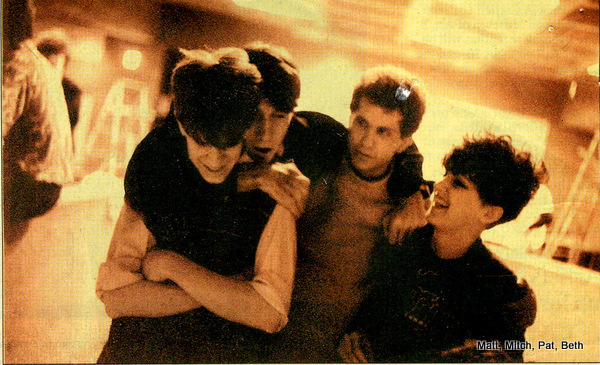 This of a band that released only four albums in its brief lifetime, the last two on a label in Greece. We’re talking Greece the country, not Greece the Rochester suburb. Rasor and Matt Kitchen, the guitarist, were students at Pittsford Sutherland High School. They went off to college. End of band, it seems. As it turned out, it’s been 20 years to bring it up to the next level. 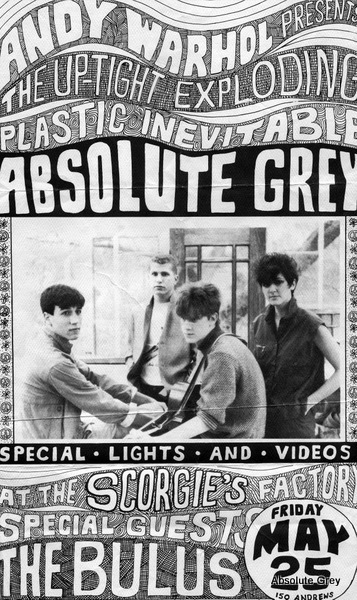 There are 10 more songs, worked on intermittently over the years, now almost ready for a new Absolute Grey release. That appears to be inevitable; the energetic Thomas will make it happen. 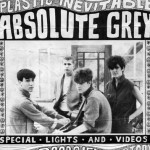 The members of Absolute Grey saved their fury for the band: “We fought like cats and dogs.” Brown and Rasor both use that phrase. Anderson agrees with Rasor on that point. “The guitarist and bass player were from Pittsford, and I think Beth was, too,” he says. “They had an air of arrogance about them, I must say. Matt had a very condescending tone, especially for a young kid, I thought. He was very serious; he was very intellectual about everything. They could see nothing but gray. Anderson recalls being in the attic studio during Greenhouse. Brown was in the basement, recording some vocals; something about the acoustics, or her needing to be alone. And he could hear her crying as she was singing her part. 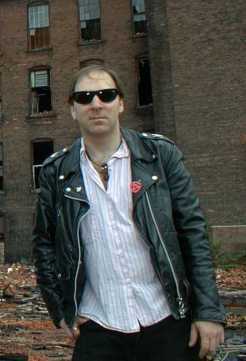 Less than a year later, Rasor was a student at Oberlin College in northeastern Ohio when he heard that the college radio station – which didn’t even know that the guitarist from Absolute Grey was on campus – had selected Greenhouse as its indie album of the year, over the likes of R.E.M.’s Murmur. But that was really the beginning of the end. 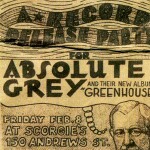 Absolute Grey proved to be a springboard for Rasor and Thomas in music. Rasor has found a way to combine his interests in architecture, landscaping, graphic design, writing and music – he’s working on his 23rd album, some of which are solo efforts – with a company called MRLD, just north of Portland, Maine. 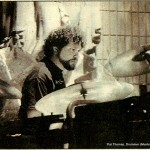 Thomas lived in Denmark for a year, then used his Absolute Grey connections for a move to California, where many of the survivors of the ’80s psychedelic-rock revival lived. 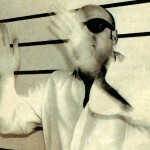 He now runs a San Francisco label, DBK Works, that re-issues classic records on vinyl. And new works as well, including his own solo records and, obviously, Greenhouse. Brown moved to Boston, enrolled in art school, drifted to Ithaca and started a sign-painting business, then moved to the Berk-shires and opened an art gallery. By then, she had a daughter – Indiana – with a German immigrant named Knut Schmitt. Now she’s back in Ithaca. She and Schmitt went their separate ways years ago. Yet in a strange twist, she’s not only caring for their daughter but also the 54-year-old Schmitt, who now is battling early-onset Parkinson’s disease. Interestingly, the 20-year-old Greenhouse has been an instrument of healing for Thomas, Rasor and Brown. It’s as though they’re seeing Absolute Grey with the clarity of the light of the south of France. Indeed, recently Brown has been writing songs. 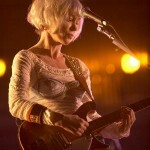 She will be on the new Absolute Grey release. 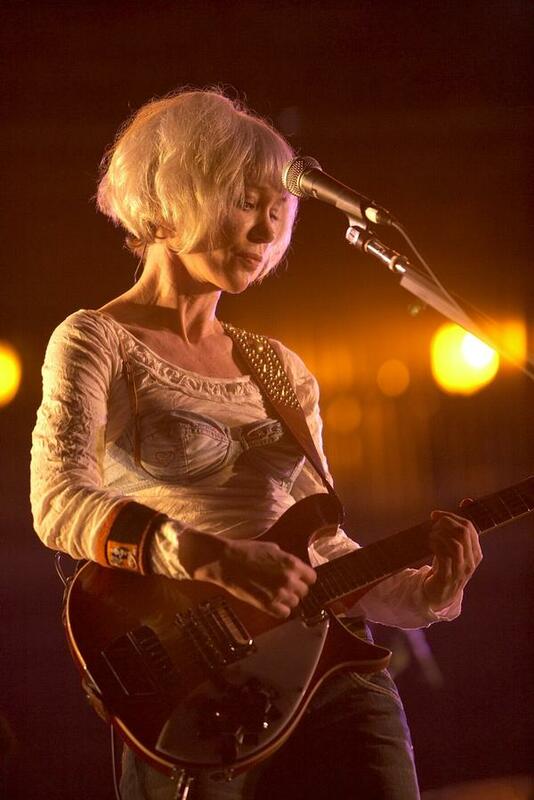 But her focus is on recording her own music, probably with Anderson’s Saxon Recording, and will return to Rochester this year to find some like-minded musicians to help. I still can remember standing in The Mason Jar (a local bar known for serving beer in canning jars)…as well as Scorgies…listening to Luther and The BBB’s. What we heard was a mixture of 1960’s Retro-Rock combined with early 1980’s Power-Pop. The BBB’s were stand-outs among Rochester bands like The Bowery Boys (w/Geoff Wilson), The Insiders (w/Walt O’Brien), and The Chesterfield Kings (w/Greg Prevost). Of these die-hard followers of The Kinks, The Monkees, The Byrds, and The Who; Luther and The BBB’s stood out like a set of new Goodyear Tires instead of some cheapo retreads. The snappy Pop tunes created were on par with Syracuse, NY’s Flashcubes (w/Gary Frenay) or with any other Power Pop band that was on Bomp! or Voxx Records in the early 1980’s. Luther and his boys have progressed to that arena (musically, at times) that includes Cheap Trick, Tom Petty, or early Squeeze. As time goes around, BBB members have followed different routes…Doug Cox, who briefly formed NYC’s Tonebenders, is now climbing telephone poles; Mike Abrams, now a family man, played a roll in both The Projectiles and The Infants; Judd Williams (known as a “legend” in Boston) plays with The Lyres, Riviera Playboys, and now tours with The Amazing Royal Crowns; and finally Jeff “Luther” Holtzman carried The BBB’s flagship through the ’80’s and ’90’s. (The BBB’s briefly changed to The 3-B’s as well). Many future members included ex-Insiders Walt O’Brien and Bob Janneck; It’s My Party/Housecats/Shakin’ Bones members Ken Peters and Hank “Blast” Karuth. In the lean years, Luther worked as a D-J for local bars and co-wrote songs that ended-up as releases from myself and/or McFadden’s Parachute. Aside from my usual “namedroppings”, a good listen to the CD (Volume One) speaks for itself. Utilizing rare vintage instruments; Luther has created an array of cool, original Rock’n’Roll as well as some updated cover songs in the bonus set. Check out the Rockabilly-influenced “The Echo”, the yearly Christmas standard “Are You Ready For Christmas”, the Psychedelic “Knee Wash”, and aggressive Power-Pop songs like “Rest Of Your Love” and “In My Mind” – all guaranteed to become repeat listeners. (On Whole Lotta Shakin’ – we usually played his “Credit Card Christmas” which isn’t on the CD). Despite the choking cigarette smoke, and overwhelming odor of urinals (at The Mason Jar – not Scorgies! ); that time was a worthy Rock’n’Roll memory and the music is still vital today. I can’t wait ’til Volume Two comes along without the ‘smells’ attached to the memories!! Hail to the Great Rickenbacker!! (Note: Since this article was written, Luther has retired from performing but has recorded about four other unreleased volumes of music with and without Dave Anderson from Saxon Recording. His former band mates now play as Shakin’ Bones). – Del. 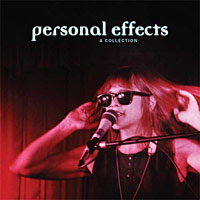 I just wrote a Scorgies recollection with homage to Personal Effects on my own blog. I must say that the many nights that I spent at Scorgies were quite unique and will never be forgotten, even if they are hazy memories. I hope that it is ok that I cross-post it here. If not, that’s cool, I will cease and desist! Scorgies was the best room in the city for live bands. They had no chairs in the place. The drinking age was still 18 so the crowd was alive. Mark Nuj had the best sound system in place down there. You could stand right in front of the band or watch from three sides. From September of 1981 to the very last day in February 1986, I lived in Rochester, NY and I loved every minute of it. It was a crazy time in my life. When other contemporaries of mine were busy settling down, focusing on careers, procuring advanced degrees, getting married and starting families, nothing was further from my mind than any of that. I wanted to live and to live very loudly. And so I did. At that time I had no idea of the depths of my sad past, but I knew I wanted to be happy. Frankly, I wasn’t happy, but one must think of how the water cuts through the rock to form the canyon or how the sea pounds the rocks to create the sand. I was happy in process I suppose. So while others were doing some of the aforementioned life living, I spent my free time slinking around all manner of unsavory nightspots, drinking, dancing and whiling the nights away. It was not unheard of for me in those days to be out until 2am, fall into bed in my tiny studio apartment on trendy Park Avenue and be up at and work by 8am the next morning. Oh to be 25! This place was a scene unto itself and was also the venue for many a great band both local and national, international. Eventually it became my number one night spot. This meant sauntering in and trying to look cool. I can’t imagine I ever pulled this off, but I did my best. One had big hair and wore lots of black, I think that was key. That and looking almost bored, as if you just happened to walk in unexpectedly. I would usually be with my friend MG. My friend MG and I are no longer friends and I must say that of all my lost friendships, I mourn this one most profoundly. MG was the single funniest person I have ever known in my life. We were friends from December of 1982 until early in 2002 and I do not think the wound of loss will ever fully close. Anyway, M and I would get into my one of our cars and head off to see what the night held for us. Generally from 1983-1986, that meant first stop was Scorgies. After entering the smokey bar space, courage would be mustered to go to the bar. Why courage? The bartender never really liked us. Maybe he was that way with everyone, but total disdain was his usual response. Even when the place was empty, he’d generally ignore us until he had no choice. He was a real local character and he has left this mortal coil. He went by the name of Luke Warm and you can about him and his passing here. I hope that Luke is resting in peace. Once some drinks were consumed and if it were a show night, one would stumble down the stairs to the very dark and even more smokey show space in the basement. Low ceiling, black walls (to my recollection) and always the spot to experience some great music. 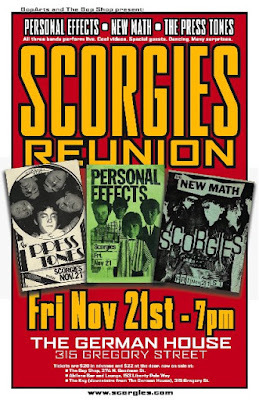 I recall some of the shows I went to at Scorgies but sadly many of them are faded due to what had to be too much beer and not enough sleep. Except that I was getting older and in 1985 when I got to hear Alex Chilton in February and The Replacements in August I was 27 and nearing the bend to 28 years old. And my recollection of either show is shaky at best. There were other nightspots – Idols opened in 1985 I think. 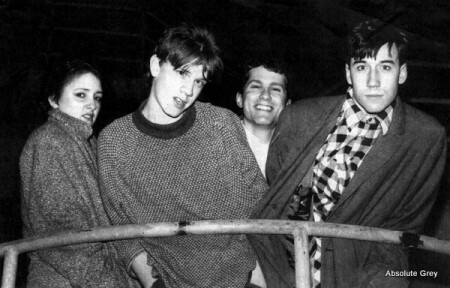 While Scorgies was more of a punk place, Idols was definitely a true 80’s dance club, although it had its own punky edge. I once went on a date there with a guy that I met through work, he was so knowledgeable about music! While we were there a song came on and he said “This song always makes me think of being at such and such.” The such and such indicated he was a young teen when the song came out. Another place that I spent a lot of time at in that last year was right across the street from Idols, it was called The Liberty and it was a very chic gay bar. My friend MG and I would traipse back and forth between the two – going from one environment to the other. Such was my life in those days. If I wanted to live out loud was definitely doing so, but sadly in ways that were not healthy for me. That said, I can’t imagine I would change too much. What happens in the past is what makes you who you are when you finally start to pay attention. Which is how I have come to see things as a 51 year old theology student, church secretary, stepmother and suburban resident. Nothing lasts forever, as the song says. Enjoy. Stan mentioned a “Where are they now” section so I thought I would write this! I got a job selling drums at the big music store here Drome Sound. 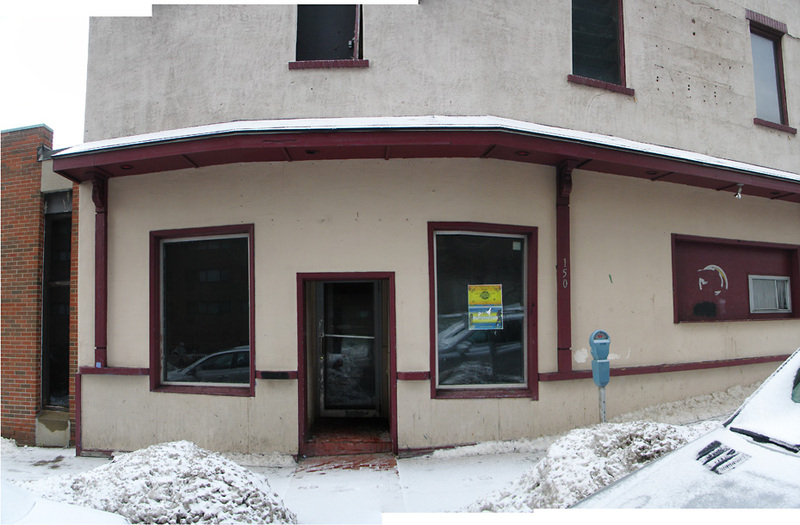 Within 2 weeks of moving here I was drumming in 1313 Mockingbird Lane Albany’s garage band! While in 1313 we released 2 45’s both of which I got to sing lead on the B-side! 1 45 even had a song I had written!!! My son was born in 1996 and I did the stay at home dad thing! Susan from Susan & The Surftones had just moved to Albany & was out the last 1313 show. She approached me and asked if I wanted to join the band. We did a few CD’s for the German Gee Dee label & a 45 for a Belgian label. We also did 3 tours of Europe while I was in the band. The 1st was in 1997. It was 8 shows in 10 days and was only Germany. The next tour was 2000 and was a 1 month tour that took me to Germany, France, Austria, Switzerland, Belgium and the next tour in 2001 was also 1 month and was some of the same but also adding Denmark. After those tours I try to make it to Germany at least once every 3 years. This year I went & also visited Prague, CZ. Now I run the mail order dept. at the local record store Last Vestige ( www.lastvestige.com ). Most of my time is spent selling records to the Russian!!! I started Thee UMMmm… a 60’s garage band & also Das Schmucks a 3 pc Turbonegro cover band. 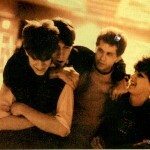 Looking forward to A Projectiles reunion! The Last attempt was on a day when Rochester decided to have a MAJOR snow storm!!! 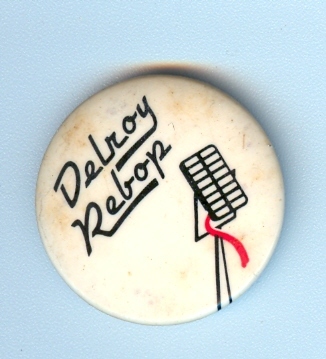 The rarer shorter red cable Delroy Rebop button. 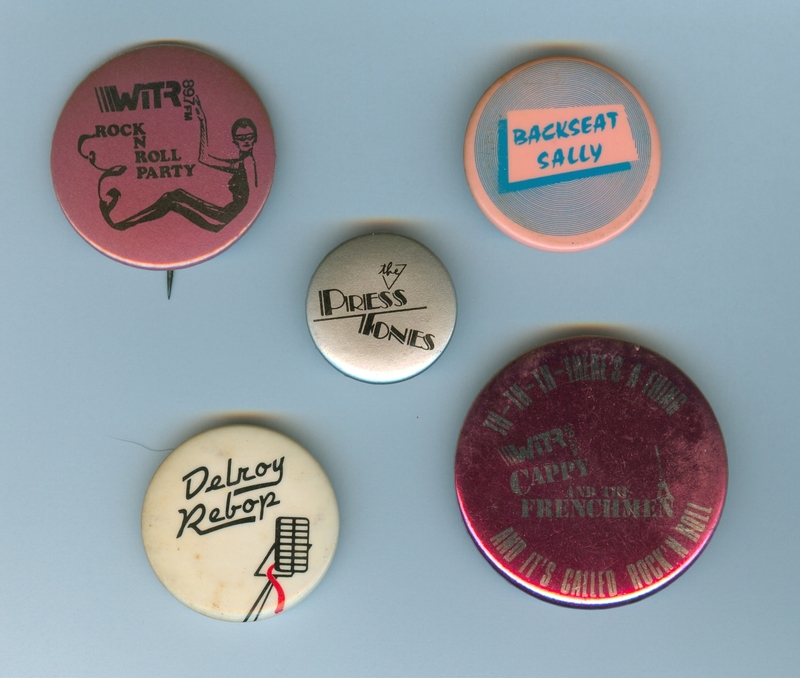 Buttons seemed to be a cheap and easy way to promote bands and causes back in the day, and here’s a few from the collection. The top left is from WITR and reads “Rock N Roll Party,” although I can’t remember if that was a show, or just a promo button from the station. To the right of that is a Backseat Sally button, though the colors seem to have faded over the years. In the center is a Press Tones button, a personal favorite, as I always like the deco style text. I would have worn it to the reunion, but I just uncovered it the other day. Bottom left is a Delroy Rebop button, with an image of a microphone. Last time I saw Del was in NYC many moons ago. Finally there is a Cappy and the Frenchmen button, and though it didn’t scan too well, it reads “Th – Th – Th – There’s a Thing” across the top, a reference to a song of the same name, with “And It’s Called Rock’N Roll” across the bottom. Just to the right of the WITR logo on the button you can make out “89.7 fm”, and at the end of the word “Frenchmen” is a picture of the Eiffel Tower.